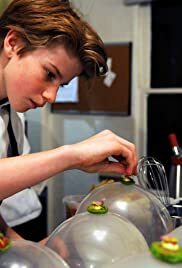 Documentary CHEF FLYNN picks 10-year old Flynn as is subject when Flynn first transforms his living room into a supper club using his classmates as line cooks. With sudden fame, Flynn outgrows his bedroom kitchen, and sets out to challenge the hierarchy of the culinary world. Like most docs on a subject that runs out of material, it gets distracted with other issues such as, in this case, the mother’s filming obsession, Fynn’s relationship with his family (father and sister) and his new restaurant’s opening night. But when the camera is on the young chef prodigy, it gets the most interesting. To director Yates’ credit, he ties the other issues to Flynn’s culinary duties. Flynn’s culinary creations look marvellous on screen though this fine dining experience may only be suited for the rich and wealthy. Still, it is a rewarding experience to see a talented youth (seen through the ages of 10-15) experience both the highs of his talent and pains of growing up too quickly.